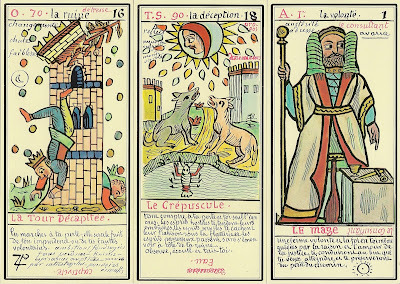 Le Grand Tarot Belline was drawn by hand using pen and ink, around 1863 by "Magus Edmond" (Edmond Billaudot,1829-1881). The decks name comes from the French cartomancer Marcel Belline, who years later discovered the deck, sold the printing rights to Grimaud and then donated the originals to the Musée des Arts et Traditions Populaires in Paris. Grimaud published them 1966 with many reprints there after. The earlier editions can be distinguished by the more generously rounded corners. The deck is using ideas from Etteilla, Éliphas Leví, and Paul Christian. Each card is divided into four sections, upper and lower bands, and upper and lower fields. Written on the upper band is Leví's mundane kabalistic letter for the Majors, the Gematria number and Paul Christian astrological correspondences. The Red Key-Words are the same as in Jeu Du Grand Etteilla. The bottom band of the card contains the card name, the bottom field of the card contains a proverb specific to the card. The gilt edged cards are large (159mm x 75mm), they came in a black box, with golden title and red velure interior, complete with red ribbon to lift the cards. 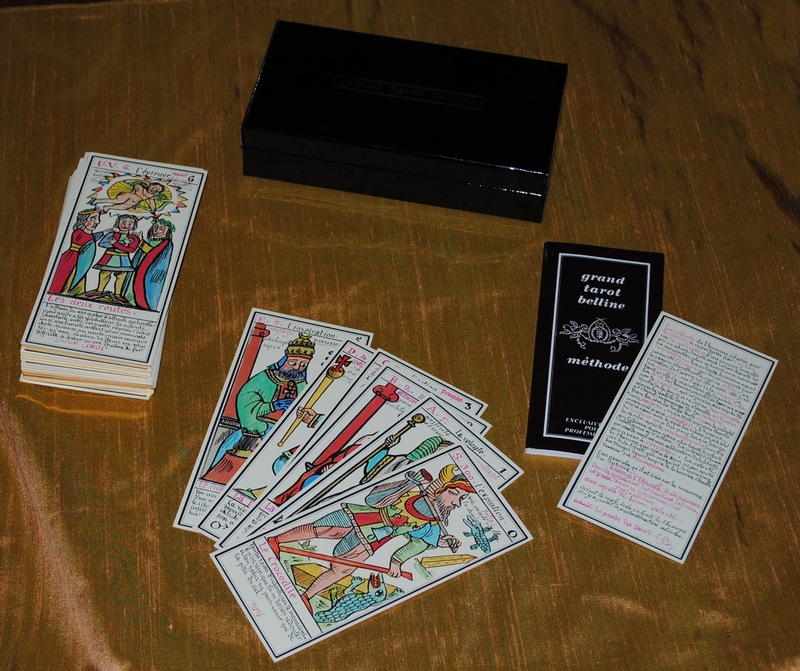 There is a Translated Documentation of the cards by Paula Goodman, with an introduction by Dan Pelletier at Tarot Garden.